Just weeks before the end of World War I, six hundred American Doughboys charged into the forbidding Argonne forest. Seven days later, only 194 walked out. The stand of the “Lost Battalion” was an unprecedented display of heroism under fire. Here are the the stories of four of those men: commander, Major Charles Whittlesey, a lawyer eager to prove his mettle; his executive officer, Captain George McMurtry; Sergeant Alvin York, who famously rescued the battalion; and Damon Runyon, the newspaper man who struggled to understand the events he witnessed. Each man trod a unique path to the war—and each was profoundly haunted by the experience. 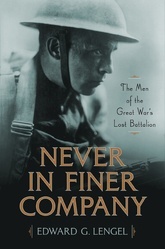 Never in Finer Company is an intensely human story of a band of brothers in the cauldron of battle.